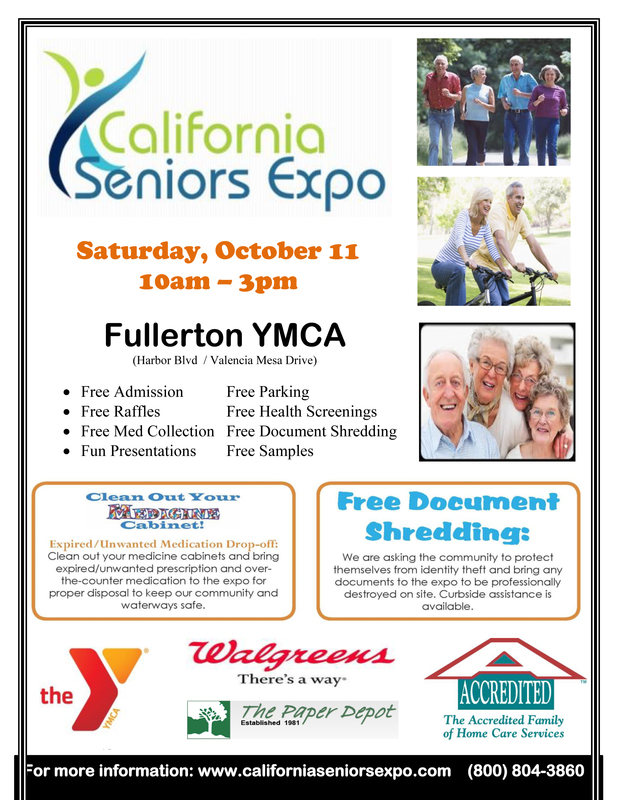 We wish to invite NOCSC to the 2014 California Seniors Expo at the Fullerton YMCA on Saturday, October 11th. For all seniors seeking ways to live fuller happier lives, California Seniors Expo is the place to go. Meet professionals who will help you transition seamlessly through the best phase of your life. The Expo will provide “one-stop-shopping” for older adults, their families and caregivers looking to connect with valuable local resources. At the California Seniors Expo, you can learn and explore options available in comfort living, housing, medical programs, leisure activities, community and government services, healthy living, and much more! Admission and parking are free. FREE MEDICATION COLLECTION One of the events at the Expo is a medication collection. We ask the community to clean out their medicine cabinets and bring all of their expired and unwanted medications for safe free disposal. FREE HEALTH SCREENINGS Our friends at Walgreens Pharmacy will be at the Expo providing free heath screens and offering flu shots at the Expo. FREE DOCUMENT SHREDDING In continuing efforts to help prevent identity theft, we are hosting free document shredding at the Expo. We ask our seniors to bring all of their sensitive documents such as old tax returns, medical records, financial records, etc. for safe on-site shredding.